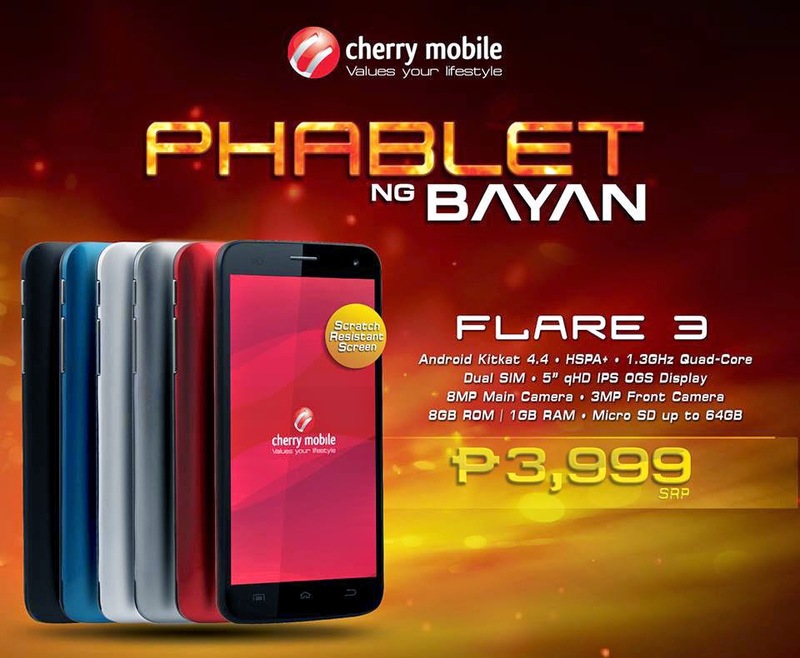 A couple of days after posting and teasing a new product on its official Facebook fan page, Cherry Mobile officially launched it's newest android phablet that features a quad-core CPU and runs on latest android Kitkat OS, the Flare 3. The Cherry Mobile Flare 3 features a 5-inch One Glass Solution Display with 540 x 960 resolution and a 220 pixel per inch density. Powered by a quad-core processor clocked at 1.3GHz, complemented by 1GB of RAM and an 8GB internal storage that can expand up to 64 GB via micro SD card. The dual-SIM smartphone has an 8-megapixel main camera with LED flash and a 3-megapixel camera on front. For only Php 3,999, the Phablet ng Bayan smartphone support a HSPA+, 3G, WiFi, Bluetooth and GPS, A-GPS connectivity. It also has a 1,980mAh battery module. Thank to its Android 4.4 Kitkat operating system, the new smartphone will surely support the latest games and apps. If Flare 3 will be success I think the next phablet name will be Flare S3 or 4..